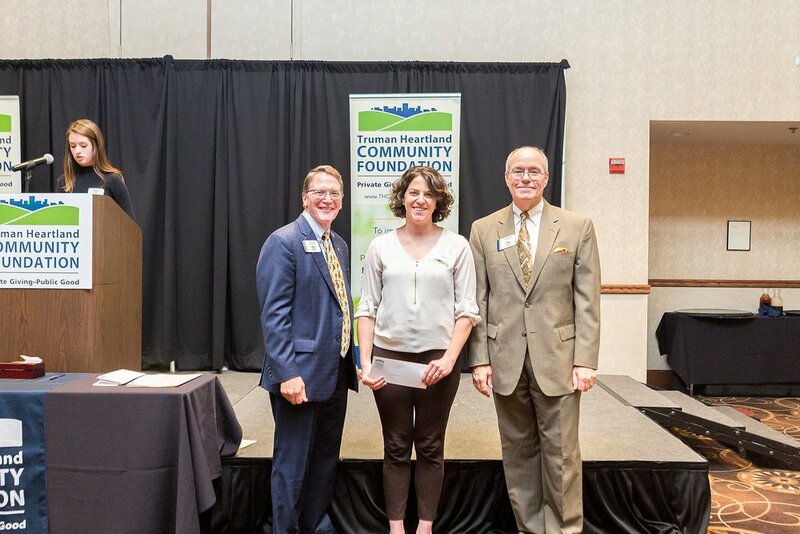 Rachel Segobia, center, accepts two grant checks from Truman Heartland Community Foundation President Phil Hanson and Chairman of the Board Cliff Jones. Two LS CARES initiatives were recently granted a major boost by the Truman Heartland Community Foundation. At its Nov. 17 annual grants luncheon at the Adams Pointe Conference Center, the Foundation granted more than $261,000 to area nonprofits to help further their community-oriented programming and missions. LS CARES received a pair of grants, including $5,000 for its Bridges initiative and $10,250 for Bully Prevention programming. “Truman Heartland Community Foundation achieves community excellence by connecting local philanthropic families and individuals with area non-profits. Small organizations like Lee’s Summit CARES would struggle to make ends meet without the targeted, localized funding provided by THCF through its donors,” states LS CARES’ Executive Director, Rachel Segobia. Bridges is an innovative parenting program that combines the long-running Love and Logic courses, academic involvement and community bonding to reduce neighborhood violence. Qualifying families receive year-round parenting education and access to a parent liaison who helps families navigate school and community resources. Lee’s Summit CARES “I Count” Bully Prevention for elementary school students provides in-classroom training for youth in grades Kindergarten, 5th and 6th grade. “I CARE” Bully Prevention for middle and high school students includes a school assessment of policies, procedures and school culture with youth-led curriculum and an awareness campaign. The secondary educational program is being piloted at Summit Lakes Middle School. The additional funding provided by THFC will go toward expanding the innovative new program into Lee’s Summit middle and high schools.